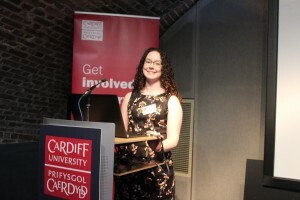 Outstanding PhD student researchers from Cardiff’s Doctoral Academy came together with Cardiff University alumni in London for Growing the Knowledge Economy – A showcase of the ‘rising stars of research’ at Cardiff University. 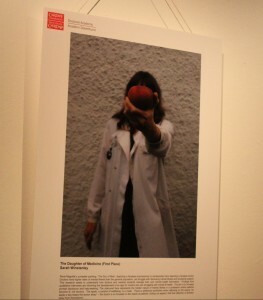 The evening began with a gallery called Images of Research, a selection of images from Doctoral researchers at Cardiff University. 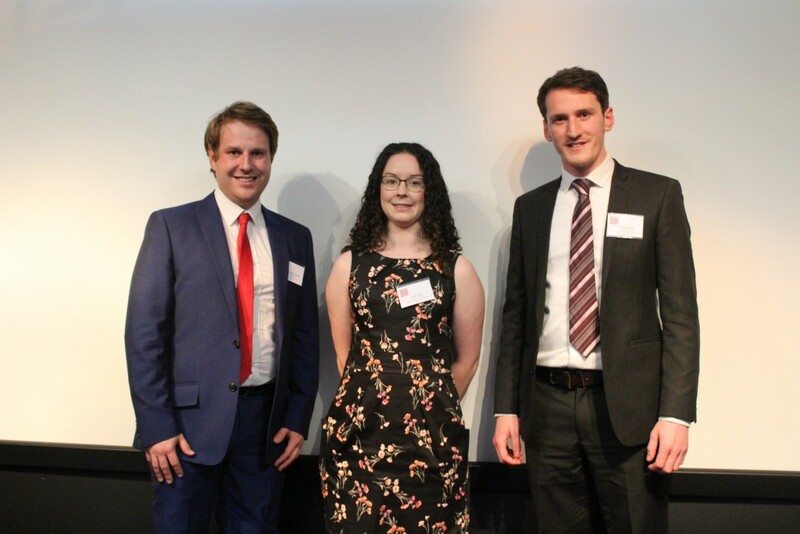 The images encapsulate the innovative and diverse research taking place at the University; they were a selection from an annual competition hosted by the Doctoral Academy. 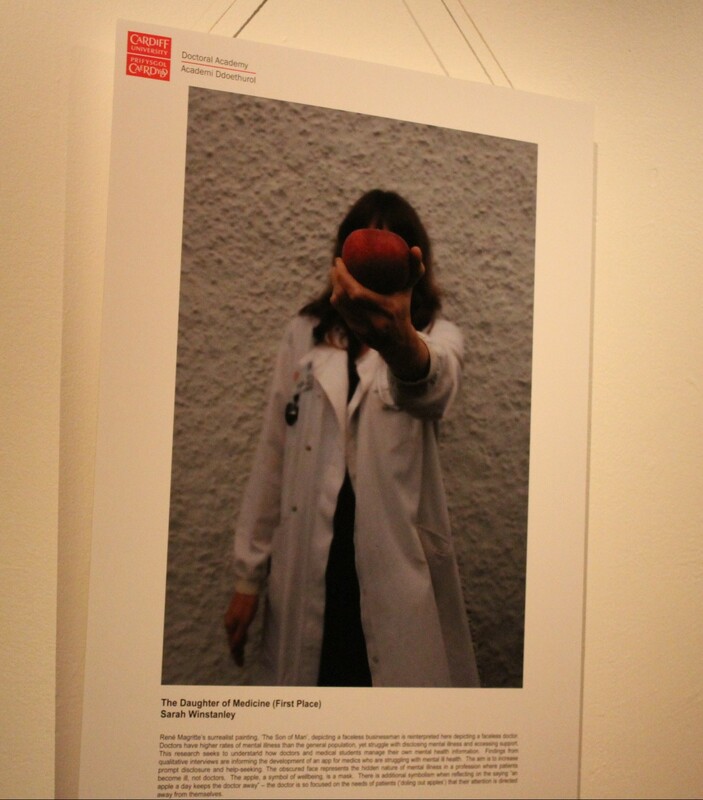 It included this year’s winner: Sarah Winstanley from the School of Medicine for her image ‘The Daughter of Medicine’, Tim Ebdon from the School of Engineering for his image ‘Bringing Turbine Wakes to Life’ and the people’s choice winner Andrew Martin from the School of Earth and Ocean Sciences for ‘Rainbow Rock’. Talks were then delivered by three leading Doctoral students. 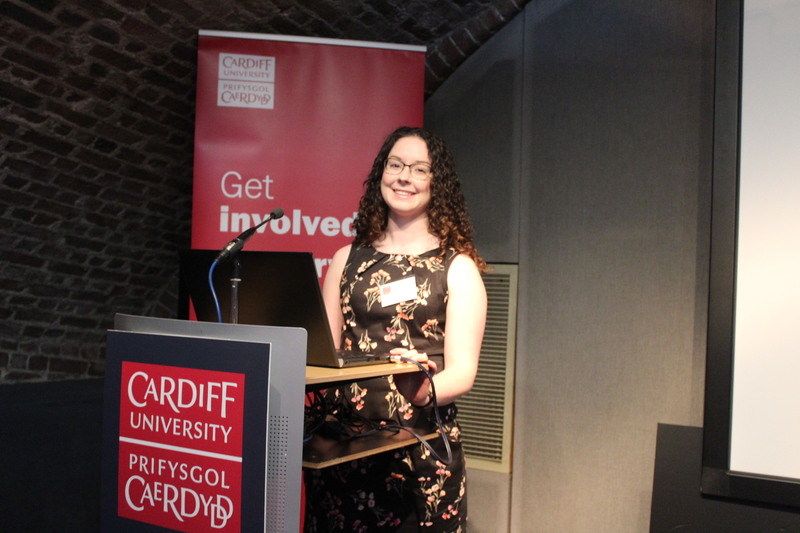 Amy Codd (Cancer and Genetics 2015-), winner of Cardiff University’s three minute thesis, spoke about cancer immunotherapy and her research into cancer stem cells and immunotherapy as a way to treat prostate cancer. Amy’s work will see her travel to Sapporo Medical University, Japan to collaborate on T cell research. 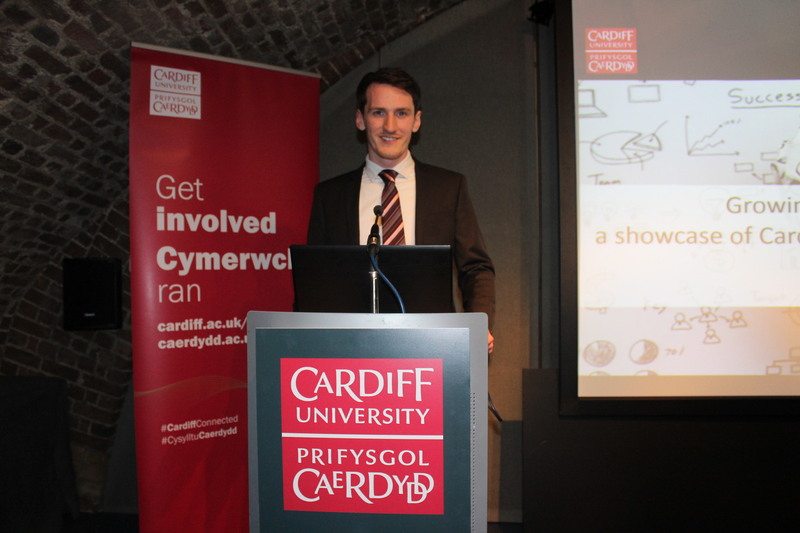 Dr Ryan Marks (MEng 2013, PhD 2016) was the second speaker, with his research into Intelligent Aircraft. 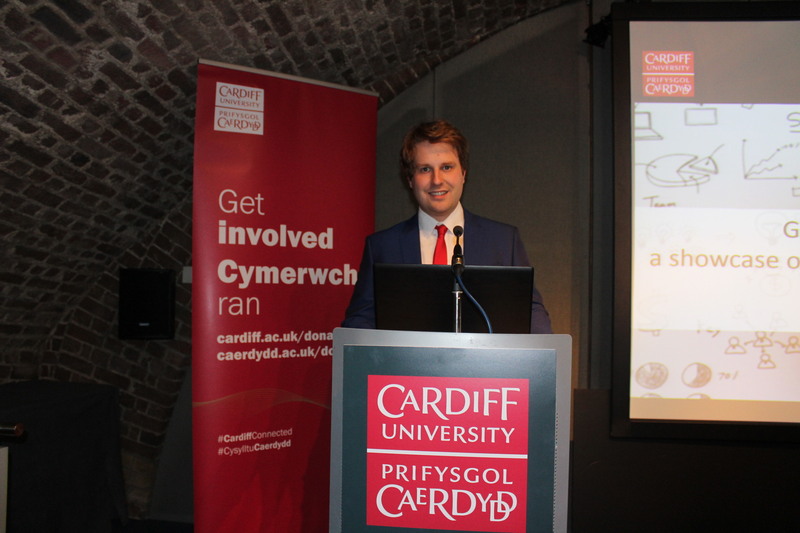 Ryan has been researching the possibility of developing self-sensing aeroplanes to prevent future air disasters and his work has the potential to improve air safety making flights safer, cheaper, greener flights with no more delays. 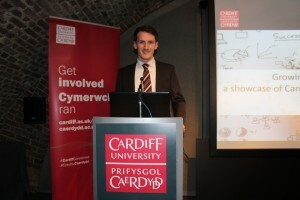 Luke Bratton (Psychology 2014-) discussed his work exposing the source of exaggerated scientific claims, studying the effects of manipulation to press releases. Luke’s research looks at how scientific news stories can be exaggerated in the press, with research resulting in headlines such as ‘Avocados give you cancer’. His presentation included identifying the culprit for the exaggeration in the press in the form of a murder mystery game, the culprit… everyone! The night ended with questions from the audience who were keen to discover more about the research, with Luke being asked whether Google had been in touch, Ryan discussing the further implications of his work in the form of adaptation in bridges and military protective wear and Amy being questioned on the controversy of stem cells. For those who were not able to make it, a video will be available soon showcasing the evening. The next event for alumni in London will be on 15 June featuring a panel of cancer researchers discussing: Your cancer is not my cancer: is personalised medicine the future?